In accordance with the Wilder way, our newest four year old had a backyard bash this weekend! 75 and sunny!! It was a glorious day for a party! 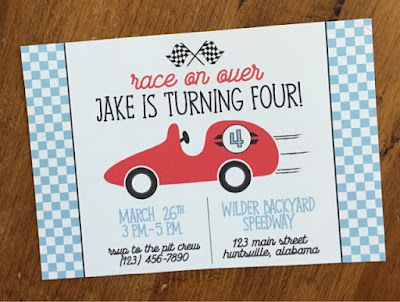 As Hot Wheels are the best thing ever (at the moment) it was a race car themed party this year! The kids had a blast! It's always nice when you can let them go nuts in a safe space. 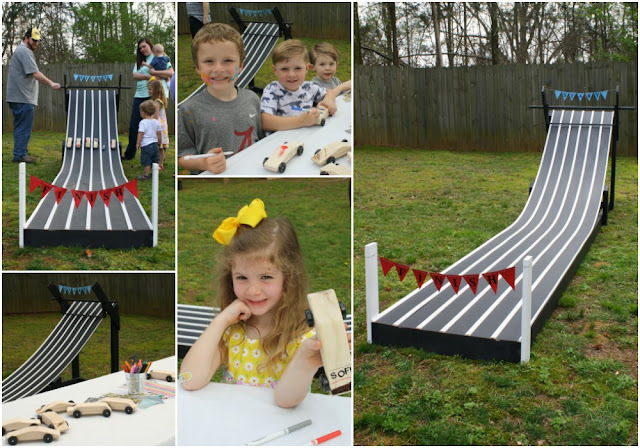 Probably one of the coolest aspects of the party was this incredible Pinewood Derby track that my brother built. I drew up some basic plans, bought supplies at Lowe's and he took it from there! We ordered Derby cards in bulk. 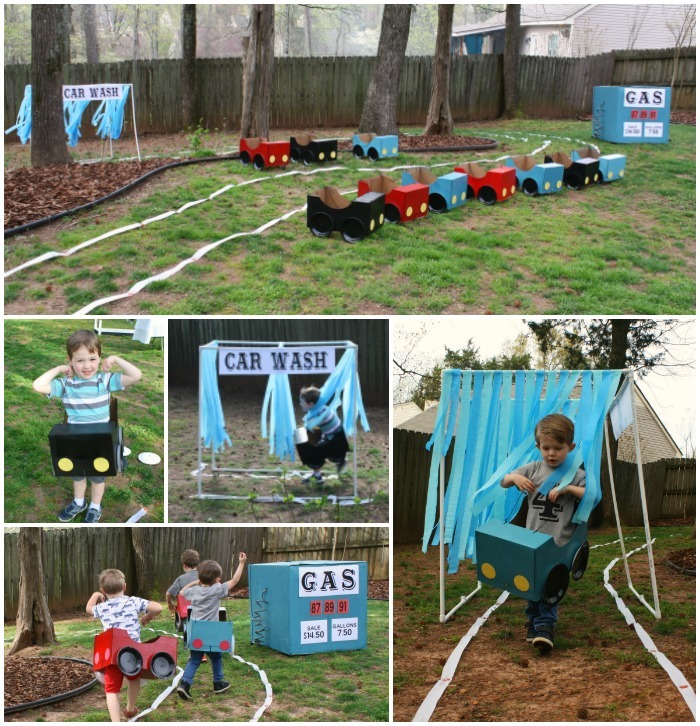 Each of the kids decorated their own car (or two) and then set them up on the track to race over and over again! I also created a kid sized race track for the kids to buzz thru. 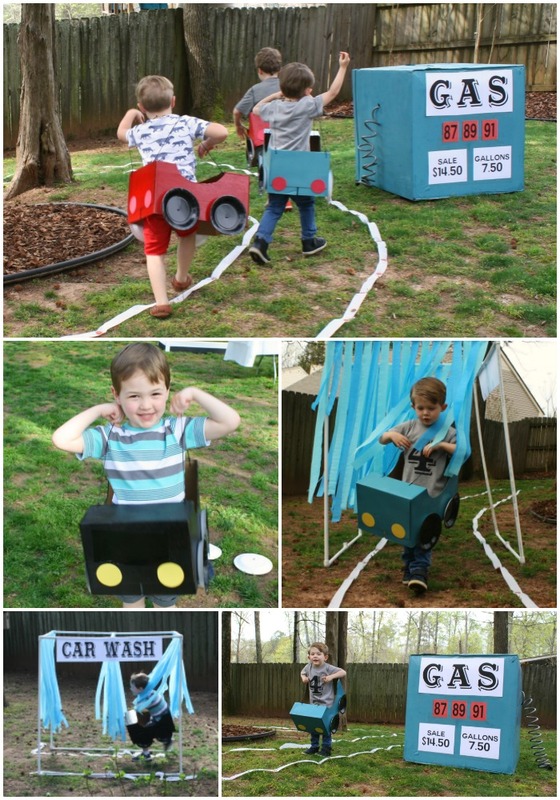 With cars made from paper boxes, they could gas up, fly thru the tunnel car wash, and then pass through the traffic light in a giant circle track in the yard. These were way more of a hit than I ever anticipated. The "before" picture looks so tidy and peaceful, but I wish I had snagged a photo of the aftermath. They ran until they couldn't run anymore. And until the cars fell apart! It was a veritable junkyard by 5pm. And what's a party without a photo booth!? I made this race car spot out of super thin plywood and some 2x4 to brace it. I can't believe how easy it was to get the kids behind it for photo ops! I made Jake's shirt using a freezer paper stenciling technique (and a $3 tshirt from Wal-Mart - more on that next week). 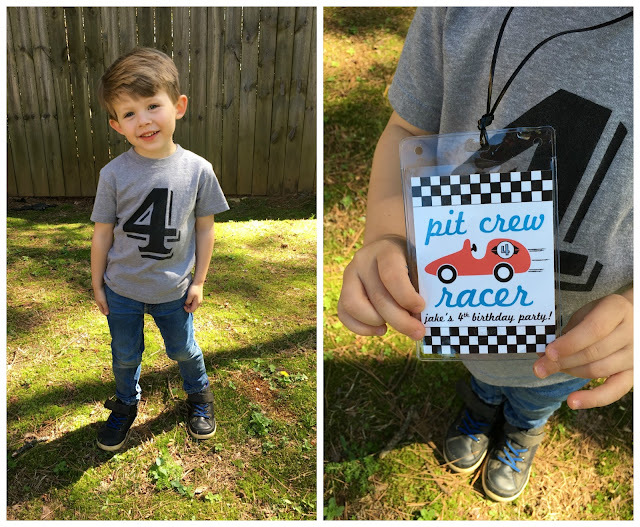 And we had sweet little pit crew lanyards for the kids! Add in a full tarp of Hot Wheels track and the always popular backyard tree house and we had ourselves a fantastic time! 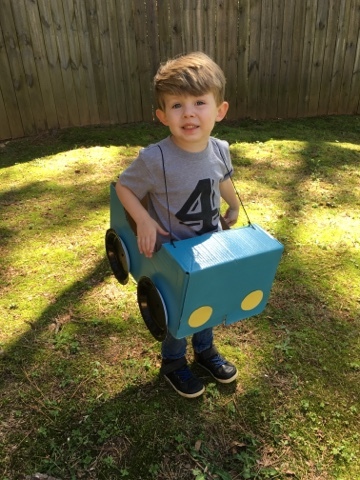 I just love how much Jake uses his imagination and truly loves to play. 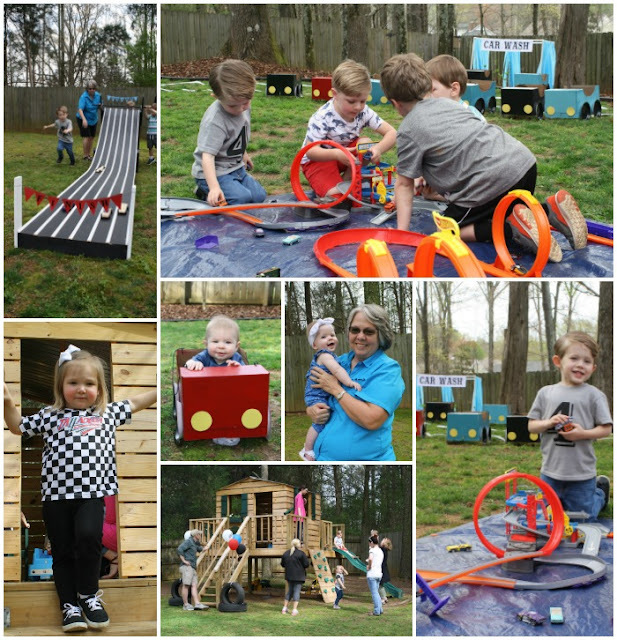 His excitement paired with my fun loving nack for the creative makes his birthday party one of the highlights of my year! Hey There...!! you have shared a great post.. planning any event can be a very exhausting and overwhelming task especially a wedding that you are planning. There are a number of social photo booth rental South Florida that have earned a reputation for offering lots of fun and entertainment at weddings and other events.